Thiocolchicosides is produced from Gloriosa Superba , the material is available in India in is a muscle relaxant with anti-inflammatory and analgesic effects and is also being used in combination with other medicines. We are highly acknowledged organization engaged in presenting remarkable range of Gloriosa Superba. We cultivate and export Gloriosa Superba seeds to Indena, Italy for pharmaceutical purpose. They manufacture as per USA - FDA and WHO's GMP regulation. So, our quality is reliable. Rotator, Big size sieves, Winnowers, Testing oven are used to separate foreign matter, and check moisture. We are engaged in supplying and exporting of gloriosa superba such as medicinal gloriosa superba and tamper proof gloriosa superba. Gloriosa Superba seeds are being used for medicinal purposes and we are the leading manufacturers in Karur. We have our own plantation for about 15 acres and we are able to supply at any required quantity. 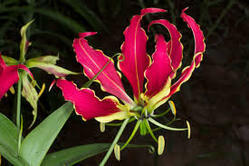 We bring forth a unique range Gloriosa superba, which contain some natural chemicals and colchicoside that are used in fabrication of anti cancer drugs. These are very effective against rheumatic fever. Our range is also used to cure various skin related diseases in an efficient way. These are available in the markets the industry leading prices to suit the demands f our clients.